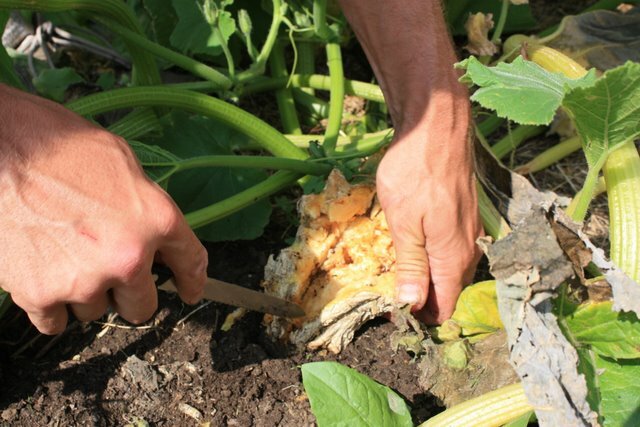 About a month ago we discussed the arrival of the squash vine borer and our control methods. Since that time we have had incredible growth on the plants and have continued to watch for the adult moths. Since the first large influx of moths in June, we have seen a smaller second flight of the moths during the second week of July. Late last week we began to see the tell tale wilting of some vines. During the heat of the day we would see the wilt, then at night and in the morning the vine seemingly recovered. This signaled that the eggs of the moth had hatched and the larvae had burrowed into the base of the vine. Thus compromising water uptake and subsequently fruit formation. 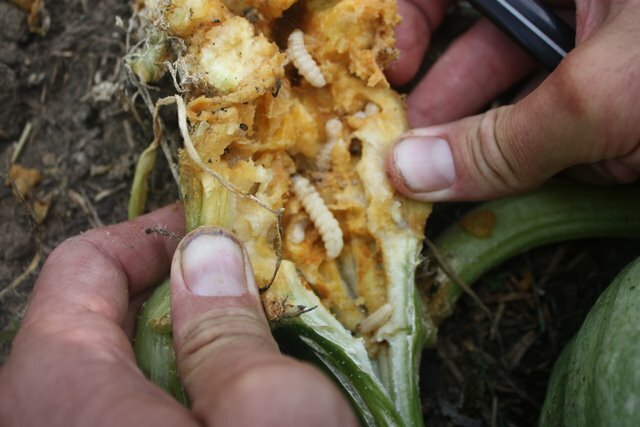 Total infestation rate on our squash and pumpkins is probably about 5-10%. It is interesting to note that certain varieties are affected more than others. This year ‘Triamble’, ‘Blue Magic’, and ‘Guatemalan Blue Banana’ were the prefered cultivars. All are Cucubrita maxima and all are blue fruited. Not sure if this is a coincidence, but surely something to observe in upcoming seasons. We have tried to save the wilting vines by slicing open the base and removing the larvae. After the base is slit you can remove larvae with a paper clip or knife. Some of our vines contained 10 or more larvae of different sizes. After extraction we mounded soil over the base and rooting nodes further down the vine. The hope is to encourage secondary rooting along the vine which will supplement the compromised vascular system at the base of the plant. So far the plants seem to be recovering we will see if our efforts are enough to mature the fruits that have already set on the vine. This entry was posted in Outreach, Pests, Plant Development and tagged flowers, fruit by bemerson. Bookmark the permalink. Terrific site with very good information for gardeners. Enjoy the pictures and comments on all the post.